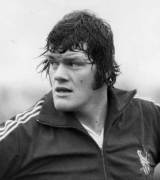 England and British and Irish Lions prop Fran Cotton was ahead of his time in terms of conditioning, and he became a legend in the white of England and the red of the Lions. Cotton's international debut came against Scotland in March 1971 and while he was too late to arrive on the international scene to warrant inclusion on the Lions' 1971 tour of New Zealand, he made his mark three years later in South Africa. Cotton played in all four Tests of the Lions' famous win in South Africa, forming a powerful scrimmaging unit alongside Bobby Windsor and Ian McLauchlan. Cotton, at over six feet tall, was seen by some as too tall for the front-row but he was complemented perfectly by the compact and powerful McLauchlan. Cotton's versatility was another key string to his bow, with his four caps in 1974 coming on the tighthead side and three against New Zealand in 1977 on the loosehead. In 1977 Cotton was also the subject of one of the sport's most famous pictures, his mud smeared face being captured as a reminder of the terrible weather conditions against the Junior All Blacks. Cotton's association with the Lions looked to have ended in 1980 when he left the tour early due to a bout of viral pericarditis, originally mis-diagnosed as a heart-attack, but in 1997 he served as the tourist's team manager as they won the series in South Africa. Following his retirement from playing Cotton set up rugby leisure company Cotton Traders alongside fellow England international Steve Smith.